All of the windows in this suite of offices were created in 1973 and 1974 by Charles J. Connick Associates, Boston, Massachusetts, and were the gift of Cornelia Marschall Smith, professor emeritus of biology at Baylor University. 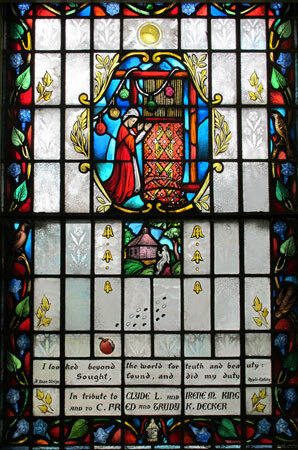 Each window has the donor's "signature" of a personal symbol recalling some aspect of the experience of the donor or her family. 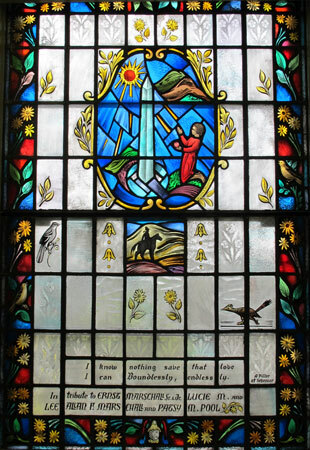 Local color is added through the introduction of native flora and fauna, a strong interest of the donor; and at the base of each window is the book plate combining the Marschall and Paschall coats of arms (notice the "paschal" lamb). 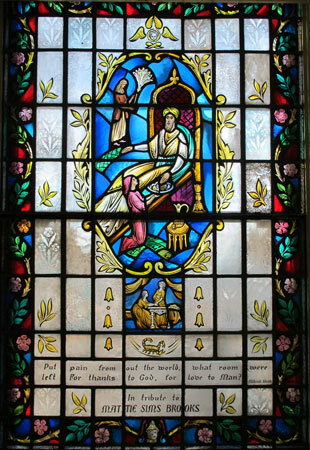 The windows incorporate visual themes inspired by Robert Browning's Ferishtah's Fancies--a work that consists of a Prologue, twelve Fancies (each concluding with a summary in the form of a lyric), and an Epilogue. In these "Fancies," Browning tackles the problems of love versus evil and the supernatural, as opposed to natural revelation, concepts that were a chief concern throughout his life. In the window devoted to the first poem, while Ferishtah has not yet attained Dervishhood, he sees an eagle feeding some young ravens, the mother bird being dead. Ferishtah interprets this to mean that God will take care of His weak creatures. But in a dream he is admonished that his part in the world is not represented by the helpless ravens but by the helpful strength of the eagle. It is his responsibility to provide saving strength for others. The lower vignette depicts the office and desk of Charles G. Smith, a professor in the Baylor English Department from 1940 to 1967, who had a passion for books, often two rows deep on his shelves. Notice the "foot-prints" worn in the tile flooring beneath his desk. The border alternates with dogwood (the flower of Charles G.'s native state, North Carolina) and lupine (the Texas bluebonnet, where he lived), accented with open books. In addition to the primary image of the eagle and ravens, there are depictions of a robin and a cardinal. Ferishtah's Fancies, I. "The Eagle"
He stayed their craving, then resought the sky. Providence cares for every hungry mouth!" God thus admonished: "Hast thou marked my deed? Was meant for man's example? . . .
Sluggard, arise: work, eat, then feed who lack!" Underfoot the moss-tracks, life and love with these! In the second window, Ferishtah, not yet a full fledged Dervish, discovers a man who had for twelve years been Prime Minister, with the power and glory of the office, but who was now reduced to such woeful circumstances that he was selling melons at a bridge by the roadside. Though penniless and powerless, the beggar tells Ferishtah that his mind dwells on the years of joy rather than on the "day of woe." 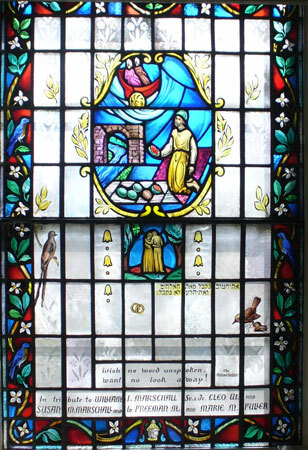 The Hebrew text in the window is from the Book of Job: "Shall we receive good at the hand of God, and shall we not receive evil?" 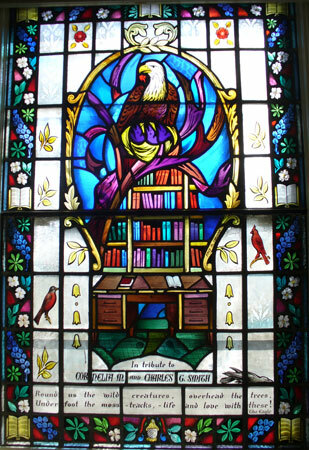 Blue birds and orange blossoms enrich the border, and the scissor-tailed flycatcher and rock wren are represented in the center of the window. The donor's vignette symbolizes a garden statue which expresses, to some degree, the devotion between husband and wife. Note the entwined rings. Ferishtah's Fancies, II. "The Melon-Seller"
Are past, I judge . . . .
Only to prove this day's the direr lot?" A day of woe to the unworthy one?" Wish no word unspoken, want no look away! The poem titled "Mihrab Shah" examines the meaning of evil and pain. Ferishtah has reached the full status of Dervish. An inquirer is led by the bite of a scorpion to ask why God, who is all-powerful and all merciful, should allow the existance of evil and pain. Ferishtah leads his questioner to a realization of the worth of pain by a series of illustrations. In their conversation, Ferishtah discovers that the Shah receives superficial devotion from his subjects who actually detest him; but when they learn that he is tormented by an internal ulcer, their sympathy for him is manifested. The wild rose border is related to the theme of the poem. The cultivated, sheltered rose holds up its blossoms proudly. What greater wonder that the weather-beaten wild rose "still lifts up with something of a smile its poor attempt at bloom." The personal vignette suggests the ideal conception of "Alma Mater," the concern and sympathy of friend for friend. Ferishtah's Fancies, VI. "Mihrab Shah"
Quoth an inquirer, "Praise the Merciful! (It swelled and blackened)--lo, is sound again . . . . But now methinks I have a mind to ask . . . .
--why needs a scorpion be?" How stands he in thy favor? Why that shrug? Is not he lord and ruler? for thanks to God, for love to man? The insufficiency of knowledge as contrasted with love is the central theme of "A Pillar at Sebzevar." In the search for knowledge, one not only gains an idea of the wonder of infinite knowledge, but receives ever renewed assurance that victory is yet to be reached--that is, love is victory. The "pillar" is a gnomon--the upright part of a sundial that casts the shadow. Ferishtah says men should love the creator of the instrument and the usefulness of his invention, but it is not necessary for him to know all that the inventor knew, nor to understand the motions of the sun and the subtleties of time. Consider the child who reaches for the sun but grasps an orange instead; it is enough that he experiences the pleasure which the orange provides. The border of wild sunflowers is accented with yellow warblers, and a mockingbird and roadrunner are designed into the field of the window. The vignette recalls the donor's family love of the hill country of Texas. Ferishtah's Fancies, XI. "A Pillar at Sebzevar"
The last and longest parable in Browning's Ferishtah series deals with the question: "A good thing or a bad thing--life is which?" Ferishtah elaborately argues the point at great length with his pupil, using black and white beans to exemplify the good and bad things in life. Viewed separately, each appears black or white, but when considered as a whole, the general effect is gray. Or perhaps, in eating an apple one discovers that half of it is bad and the other half good, should one call it good or bad? One of the most striking passages occurs when Ferishtah puts aside the beans and describes the weaving of a carpet. The separate strands are not particularly pleasing to the eye. Some are garishly bright, others dull, but when all are woven together by the artist a beautiful wonder is created in color, born of both. So God mingles His own qualities with man's, good with evil, to produce the miracle of our existence. Interspersed into the border of the morning-glory vine are a mourning dove, meadow lark, and brown thrasher. Notice the black and white beans, half-eaten apple, and above the major image a symbol of Browning's reference to a haloed moon: "moonlike through vapor." The personal vignette recalls a morning when Cornelia's sister, Irene, was discovered missing from home, only to be found--still in her bed clothes--anxiously waiting for school to begin. Ferishtah's Fancies, XII. "A Bean-Stripe, Also Apple Eating"
And lie at gorgeous length in Ispahan! A medium profitable to the sight?'" Sought, found, and did my duty.